Area, Area, Area - Golf, tennis, swimming. Secure and upscale. Owners live in Tucson, convenient for any unforeseen problems that could arise. golf clubs available: Don't want to rent or pay for shipping you golf clubs. We can provide ladies or men's right handed clubs, six new balls ,tees, and a bag. Come and see us. Skylights in both bathrooms which are beautiful decorated & match bedroom color schemes. Plenty of storage space for toiletries. They are fully stocked with toilet tissue & Kleenex. Hallway between the m/bedroom/ bath & guest bath has 2 large linen closets loaded with linens , bath towels, pool towels, cushions for patio furniture & ample cleaning supplies. Both ladies & many sets of men's golf clubs bags,are available, & we will supply 6 newgolf balls & tees 7 bag per person. For golfers who are flying this is a plus with airlines now charging for extra bags. Great place to stay in Tucson! We loved our stay in this unit! Very large (1600 sq. ft.), close to Catalina Mountains, very quiet street and neighborhood, unit well-equipped with everything needed for day-to-day living, very clean, and a two car garage included for our use! During our entire stay (12 days) we encountered absolutely no noise from any neighbors which was wonderful; very private! Owner lives in area and was very responsive to any questions but also was very respectful of our privacy. This townhouse was lower in price and larger than other places we considered, was well-represented by the photos and description online (actually better than we expected which is a glowing review in itself!) and turned out to be an exceptional value for our dollar! We would definitely stay here again! Stayed the month of January 2017 and had a pleasant month in this townhouse. The owner was hospitable and accommodating. The townhouse is clean, well appointed and well maintained. Overall, an enjoyable experience and would heartily recommend it. Glad you enjoyed your stay. Looking forward to your next year's visit. I would issue a challenge to anyone to find a better equipped condo. The range of cooking equipment was excellent, even including basic spices and herbs. The physical condition of the unit was also excellent. A great place to stay. We plan to go back soon. We visited Tucson in the middle of December, 2009. This townhouse is an excellent place to stay. The landlord was friendly and helpful, the townhouse was well appointed with everything you could possibly need on vacation, and the location was wonderful. We would wake up to have coffee on the patio and watch the sun come up over the mountains. The beautiful garden was flowering in December! A little later, we would go for a nice scenic jog around the neighborhood. Many people were out and about jogging, biking and walking. This townhouse is conveniently located near Sabino Canyon which is a beautiful park to walk or hike in, so we went there several times that week. Grocery stores are about 1.5 miles away, as are banks and several restaurants. This well appointed townhouse is located in a nice, quite area of Tucson, with well kept properties surrounding it. We will be returning next year for another visit since we enjoyed this vacation so much. Location, location, location! This home is in a lovely part of Tucson close to golf and mountains. It is a beautiful, clean and comfortable home with a lovely patio. The owners have everything you need especially in the kitchen. Real all the reviews and they say it all. Don't hesitate to rent this place. This is a great home for 2 couples. We would refer this home to friends and family in a heart beat. Great caring owners. Everything you would want in a vacation rental is here. Nice quiet neighborhood and the heated pool/hot tub, tennis courts are just one walking block away. Lovely patio with gas grill, umbrella table and chairs. Many visiting birds--great horned owls, hummingbirds, finches, hawks, quails, etc., frequenting the flowered shrubs on the patio--sun in the morning on the patio and most of the day. Deloris has decorated wonderfully. 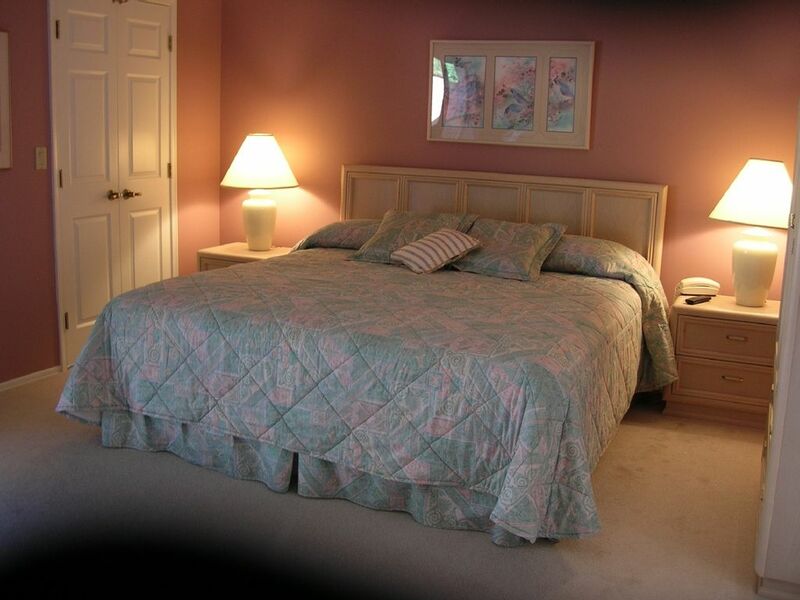 Very large master bedroom with walk in closet and nice showered bathroom. Large guest bedroom with large closet. 2nd bathroom has a tub/shower. Plenty of light in bathrooms, walk-in-closet, kitchen, dining room with skylights. Fully equipped kitchen with all the amenities. Kitchen island has seating for two and there is a table for 4 also. Living and dining room is very large with nice comfortable seating with very nice TV, DVD, stereo, etc. Two car garage. This townhome is close to shopping, restaurants, etc. and Deloris has left info about all of these and where they are located. All in short driving distance. Computer hookup at desk in the kitchen--bring your own laptop. We will definitely like to rent again when we visit Tucson. Very reasonably priced for what you get and we would suggest that you give this rental a try! We visited our relatives and friends, Saguaro Nat'l Park, Reid Zoo (very nice small zoo), Botanical Gardens, Organ Pipe Nat'l Park. A must for restaurants--El Corral Steak House and the local soup/sandwich shops. Mount Lemmon, Sonora Desert Museum, a must. Kitt Peak Observatory, University of AZ, Kartchner Caverns,Southwestern site and cultural historic sites, Live Theater,Opera,historic 4th Ave shopping district mission San Xavier del Bac founded in 1692. Sabino canyon. An hour away is Tubac, originally a sleepy little village- today, a collecting spot for art, crafts & history, Pima air & space museum, Colo Nat'l Forest. In Nov. Tucson hosts the EL Tour de Tucson bike race.